If you leave the front door unlocked, don’t be surprised when criminals decide to take advantage of the opportunity. That’s common sense for millions of families in America, but a lesson that liberals still haven’t learned regarding the country’s southern border. While Democrats have pushed back against President Donald Trump and insisted that there’s no crisis at the U.S.-Mexico border, a disturbing case in Albuquerque is raising eyebrows. Federal authorities are currently pursuing cases against two brothers in New Mexico, and emerging details make it clear that the nation has a problem. Last year in August, police officers pulled over a GMC Sierra pickup truck in Bernalillo County, New Mexico. That by itself isn’t newsworthy, but what the cops discovered inside the vehicle made their jaws drop. 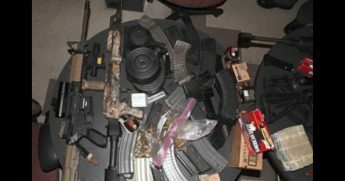 “They found eight rifles, six handguns, night vision goggles, armored vests, more than $33,000 and a small amount of cocaine,” according to a report by the Albuquerque Journal.Police had stopped a hardened drug smuggler named Jesus Samaniego-Villa, who was wearing a ballistic vest while outfitted like a soldier planning a raid. “Two of the rifles — one fully automatic and classified as a machine gun — had been reported as stolen,” the Journal continued. You guessed it: The cartel members simply hadn’t bothered getting their weapons legally. This was no amateur crook. Officials quickly linked Samaniego-Villa to a Mexican drug smuggling operation that included his brother Sergio and other criminals. Unsurprisingly, they were in the United States illegally — and it’s likely that they had crossed the border many times. In fact, slipping out of U.S. custody seems to be a specialty of the Samaniego-Villa brothers. “(Sergio) was deported in 2012 while facing state drug charges in Bernalillo County after bonding out of the Bernalillo County Metropolitan Detention Center,” the Albuquerque Journal said. This barely deterred him, as he evidently re-entered the United States illegally a short time later. Then — incredibly — they were let go once again, even after being arrested on serious drug crimes in early 2018. “According to federal court documents, an FBI task force started investigating Sergio’s drug trafficking organization in February 2018 and bought a half pound of heroin and a quarter pound of cocaine last year,” reported the Journal. Sergio and his wife were arrested, but walked away. “They were initially charged in state court with drug trafficking and released on their own recognizance,” the newspaper continued. Yes, you read that right: Even after illegal aliens were caught selling cocaine and heroin to FBI agents, the court system just shrugged and let them leave custody. It turns out that international criminal drug dealers don’t follow court orders. Who knew? “They were supposed to stay in New Mexico but went to California and, according to court documents, missed court dates in Albuquerque. And, the records allege, they continued to sell drugs,” said the Journal. Even now, with brothers Sergio and Jesus Samaniego-Villa back in custody, the accused cartel soldiers could walk free if their attorneys succeed in convincing a judge that the traffic stop of the heavily-armed Jesus was improper. There are a few major takeaways from this case. The first is that liberals are in denial about what is actually happening near the southern border. America’s front door, to use the analogy, is not just unlocked but wide open. We have no idea who is crossing or what they’re bringing with them, although piles of drugs and fully-automatic weapons clearly are part of it. And that brings up the second point: While Democrats continue to push stricter gun control laws, they still have not realized that criminals like the Samaniego-Villa brothers just don’t care that their weapons are illegal. Passing more and more gun laws will not stop hardened criminals from smuggling fully-automatic rifles and other cartel weaponry into the United States, at least not while the southern border is largely undefended. Until liberals take border security seriously, everything else is meaningless.